I recently had the privilege of experiencing just a sliver of the 263 acres of healing land that is The Elohee Retreat Center. I was attending my first ever Yoga retreat, hosted by Jessica Calderon and Antoinette Moura of the Mystic Moon Tribe. Not knowing what to expect, I embarked upon this journey with a posture of openness, to experience and receive all that was meant for my soul and more. Fifteen incredible women converged to inspire, encourage, and hold space for one another as we all experienced a truly magical weekend. The weekend began with me carpooling to the retreat with a newfound friend – a connection through one of the retreat hosts. We chatted the entire ride as if we had been old friends reunited after a length of time apart. What a prelude to the other beautiful souls I’d meet! “We’re getting close!” sprang into my mind as the asphalt transitioned into a gravel road. A wave of excitement rushed through me. We followed the signs to the “Thanksgiving House” and my mind started to race with the retreat center images that I had seen online. 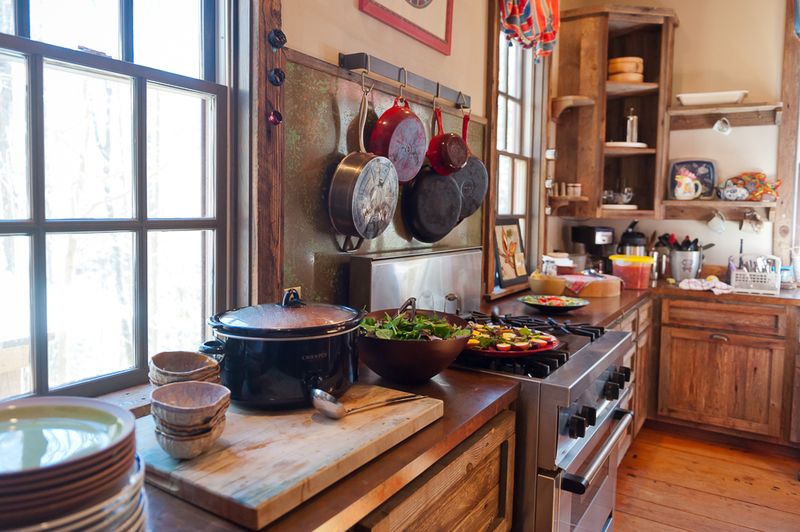 The Thanksgiving House was the perfect backdrop for the memories created during this retreat. It was so much larger than I had imagined, yet still felt warm and cozy. This would be where we called home for the next 48 or so hours. Carefully appointed with character and personality, everywhere you looked, there was something delightful to capture your attention. Quaint details like the boot scraper at the front door, the cutest Dutch door with a super-low doorknob (which I’m sure has a story of its own) and adorned little nooks and crannies throughout the home. Making our way in through a narrow entranceway and into the foyer, we were greeted with hugs and hellos by our retreat cohosts as they saged and prepared the space for our magical weekend! We continued into the large living room, admiring the grand fireplace at the heart of the room. That fireplace would masterfully be kept ablaze for the entire weekend. There were comfy chairs everywhere adorned with throws to help keep us warm. The bookshelves were filled with books, treasures and even an assortment of Yoga sound instruments. And wait! Is that a Tea Bar? “I’m never leaving!” Could you believe that it just kept getting better? As I stepped foot inside the spacious (and fully stocked) kitchen, you happen upon beautiful cabinetry, hidden appliances, displays of unique, handmade dishware and a farmhouse sink – Chip and Joanna Gaines would be so proud! A low rumble behind me peaked my curiosity. 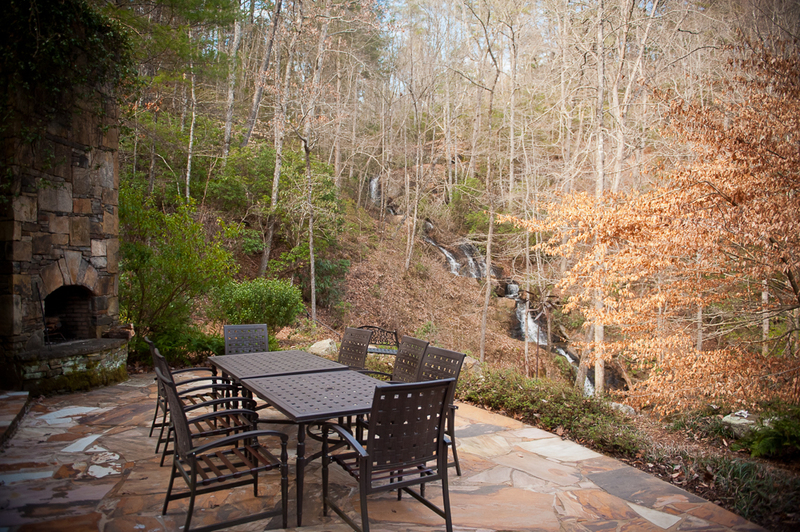 I turned towards the back patio doors to find the most stunning view of a 100-foot high cascading waterfall! Are you kidding me? In our backyard? Particularly rainy Summer and Fall seasons had blessed us with a thunderous wonder in our backyard. We were being enveloped in and recharged by an overabundant natural source of negative ions – captivated and humbled by the wonders of nature and its healing powers. Everyone now settled in, exploration of this beautiful place was temporarily interrupted. We would gather together by the fireplace for the first of many times for an intimate introduction and welcome message from the retreat center owners, Evie and Michael. Serenity and a sense of happiness exude from this couple as they shared their journey, the story of their land and even how the word “Elohee” had been derived from many languages to invoke the collective spirit of “Welcome”/ “Sacred” /“Earth” / “Healing”. They closed their message with the invitation to “…make [ourselves] at home.” That was going to be effortless. With that, the Mystic Moon Retreat officially kicked off with our first activity – a Yoga and Meditation session in the dedicated Yoga room on the third floor with a higher vantage point of the captivating waterfall. 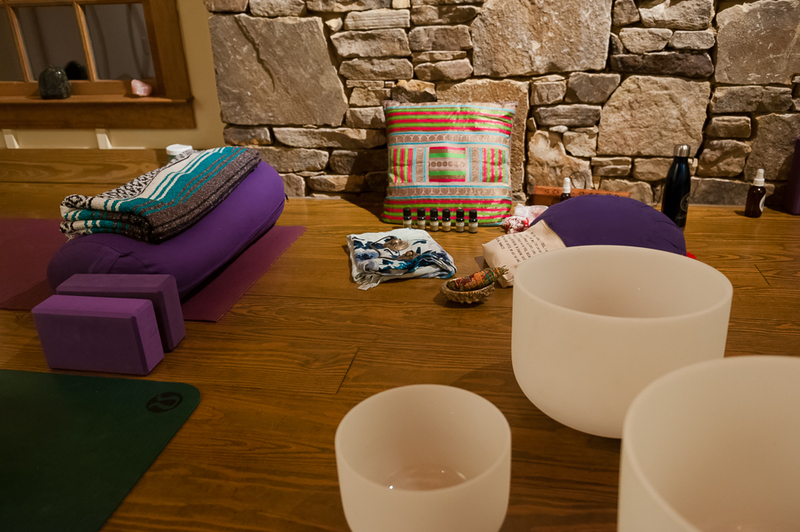 The retreat center provided everything needed for a comprehensive Yoga practice; right down to the mats, all sorts of props, and Tibetan Singing Bowls. Our next activity brought us back downstairs, to break bread for our first meal together. A Whole 30 based menu expertly prepared for the Mystic Moon Tribe by Elohee’s own Chef Kat. She also did a wonderful job accommodating my plant-based dietary requests for the weekend! Retreat activities continued well into the evening. The connections in this group were profound and immediate; however, with early morning moves on the horizon, we all reluctantly parted ways to retire to our rooms for the night. My room was a special one. A converted wine cellar right off of the main living room, it had been etched into the side of the mountainside. I felt as though I were safely nestled into a snug little cove. As I was getting ready for bed, I was encouraged to step outside to take in the night sky. Literally splattered with thousands of stars, there were more than I ever remembered seeing since my days as a very young girl visiting family in Richmond, Virginia. In the chill of the midnight hour, I found myself seated on a bench that by day, offered a front row seat to the majesty of the waterfall. I rested my head back and sat in presence and total amazement of the starlight painted sky. I could not have been more grateful for that moment, especially since the next night would be a cloudy one, obscuring most of the view. I must admit, though, that as I sat there, I did say a few prayers, hoping that Evie was right that the resident bear population was really in hibernation. I returned to my room with a full heart and a busy mind, lying in bed trying to allow myself time to process all that had transpired in only those first few hours. My mind calmed as I was slowly lullabied off to sleep by the crackle of the dwindling fire and the still throbbing waterfall offered such calm. We would wake early the next morning, to start the day with more movement and meditation, followed by a delicious morning meal. We remained gathered afterwards, but moved to the living room for more retreat activities. As the day matured, an unseasonably warm and gorgeous February afternoon called us outside into the healing lands of Elohee! We took a group hike up to the top of the mountain. Perfectly marked paths effectively navigated us through our enchanted surroundings. During our hike, the woods were oddly quiet – not a bird chirping nor a squirrel scurrying – only the soft babble of the creek that fed into the waterfall. Nature was truly inviting us to commune with her and to go within, void of her beautiful distractions. Nearing the summit, we discovered several other retreat facilities. 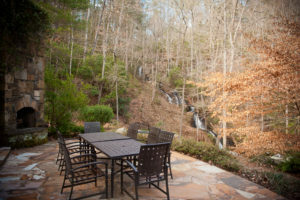 At the top, a breathtakingly sweeping landscape of distant mountaintops, a beautiful pond, and a miniature waterfall opened up right before our eyes. What an extraordinary treasure! We relaxed and recuperated in the area around the pond, chatting and taking photos amidst nature. The time came for us to prepare for our descent back down the mountain. In perfect timing, a beautiful (and extremely large) hawk swept by us. A particularly meaningful moment for me which my retreat sisters knew as they shouted my name and recalled a story I’d shared the night before about my recent encounter with a hawk. We watched as our beautiful visitor glide across the sky and disappear in the distance. Circling back and hovering overhead one last time as we departed. Full of inspiration from our hike, we returned to the house in perfect timing for a Vision Boarding exercise and much needed journaling time. There was just so much for me to unpack! The night wound down as we gathered for one last dinner together, some restorative Yoga and a bit of self-care time with a Neal’s Yard facial experience. Sunday morning arrived with a bittersweet swiftness. Breakfast together was spent recounting moments from the weekend with laughter and joy, collecting ourselves and preparing to join together for a closing session of Yoga, Meditation, Reiki and one last opportunity to share our experiences with one another. There was, as you would imaging… More laughter. More joy. Some tears. All of which will continue to offer us a beautiful collection of memories to last a lifetime. The session adjourned so that we could break bread for the last time. Probably our most brief meal together, we needed to refuel and get packed up in order to make our journeys home; some traveling longer and farther than those of us who had only commuted in from the Metro-Atlanta area. Several of these beautiful ladies had traveled in from as far as Alabama, Florida, and Alabama. My sincere gratitude that they did, it was an honor to meet each and every one of them. 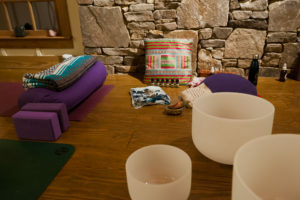 My weekend at The Elohee Retreat Center for the Mystic Moon Tribe New Moon Women’s Retreat was truly one of the most incredible experiences of my life. My hope is that someday soon, you might partake in an experience there that is as meaningful for you as mine was for me. Namaste. After a corporate lay off in 2007, Andria Lavine pursued entrepreneurial endeavors as a full time professional photographer. She quickly found that her business offered something far beyond what she could have imagined as she connected with amazing people and affected lives in a way she’d never considered. Photography provides an opportunity to capture moments in someone’s life; moments that can transport you back to important milestones and memories. In 2016, she embarked upon a personal passion project documenting her wellness journey and practices on social media – Yoga, meditation and plant-based eating. Closing the first year of her personal project, she found an overwhelming sense of community and connection to those she’d come to know and was amazed at how a small step of obedience manifested into something greater than just pictures of her food and Yoga practice, but that her photographs were inspiring others to do, to be, to consider what may have previously been considered “impossible”. All things are possible.